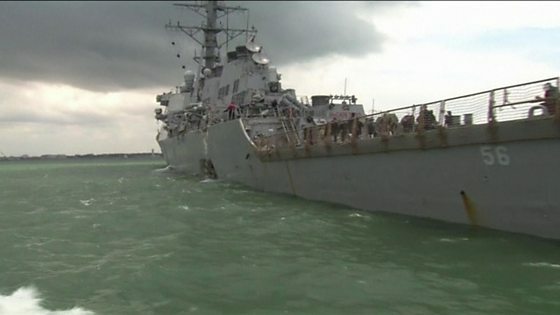 Divers from the US Navy have begun searching for 10 sailors still missing after their destroyer collided with a tanker near Singapore. They will search the affected parts of the USS John S McCain as well as carry out an assessment of the damage. Meanwhile, a major air and sea search in one of the world`s busiest shipping lanes continues. The US Navy has ordered a worldwide "operational pause" of its fleet since the collision on Monday. It was the fourth crash involving a US Navy ship in a year, and the second in the past two months. Where are the missing sailors? It is not yet known. Ships, equipment and aircraft from the American, Indonesian, Malaysian and Singapore navies have been scouring the seas east of the Straits of Malacca and Singapore where the collision occurred. US military helicopters as well as the Singaporean and Malaysian navies and coast guards are also involved. Fishing vessels along the Johor and Pahang coast have also been told to keep a look out. The US Navy said its divers would search the USS John S McCain, which is currently docked at Singapore`s Changi naval base. Equipped with surface air rigs, they will access sealed compartments in the damaged part of the ship and carry out a damage assessment on the hull and flooded areas, the US Navy said. What do we know about the collision? The USS John S McCain was sailing east of Singapore when the collision with the Liberian-flagged vessel occurred. It was reported before dawn at 05:24 local time on Monday (21:24 GMT on Sunday) and took place as the American vessel was heading for a routine port stop in Singapore. The destroyer sustained damage to her port side, which is the left-hand side of the vessel facing forward. TheUS Navy said five sailors were injured, four with non-life threatening injuries who were medically evacuated to a Singapore hospital while the other did not require further medical attention. At 182m (600ft), the tanker is slightly longer than the 154m-long US destroyer. It had been carrying nearly 12,000 tonnes of oil from Taiwan to Singapore, Reuters news agency reports. The Alnic MC is currently at the Raffles Reserved Anchorage in Singapore. What about the `operational pause`? Navy Admiral John Richardson, the chief of naval operations, has ordered fleet commanders to stop what they are doing for a day or two over the next week to "assess and review with their commands the fundamental practice to safe and effective operations". He has also ordered a more comprehensive review "to find the contributing factors and root causes of the incidents". "My hope is that we will learn, continue to improve in the short term, validating that we are sound on the fundamentals and if not then we`ll take action to correct that, and then look at broader, more systemic issues that we may find through this comprehensive review," he said in a statement. He also said on Twitter that he would not rule out the possibility of some kind of outside interference or cyber-attack being behind the collision. What`s the response so far? China`s state newspaper, China Daily, was quick to suggest "increased activities by US warships" in the region "are making them a growing risk to commercial shipping". The paper was referring to US freedom of navigation operations it has been conducting amid growing tensions in the region over territorial claims to the South China Seas. China claims almost all of the South China Sea, including reefs and islands also claimed by other nations. Meanwhile, US Senator John McCain tweeted that he and his wife were praying for the sailors. The vessel was named after his father and grandfather, both admirals in the Navy. "I agree with Admiral Richardson that more forceful action is urgently needed to identify and correct the causes of the recent ship collisions," he added. US President Donald Trump has also put out a tweet about the accident. US Navy losing its edge? Jonathan Marcus, Defence Correspondent, BBC News Two serious collisions with merchant vessels; some 17 crew members dead or missing; and two guided missile destroyers of the US Seventh Fleet out of action for months - good reason then for a thorough review. But are these unconnected episodes or part of a broader systemic failure? This is what the new review will have to find out. Analysts and former officers note the high tempo of operations. The US Navy - despite its size - is just not large enough, they say, to do everything that is asked of it. And the dramatic growth in merchant shipping - the real measure of our globalised world - means the sea-lanes are now more crowded than ever. For years the US Navy has had no obvious peer competitor. And some fear that it may be losing its edge. What happened in the previous collisions? This is the fourth time in a year that a US navy vessel has been involved in an accident. Those who died were found in flooded berths on board the ship after the collision caused a gash under the warship`s waterline. In May, aguided missile cruiser collidedwith a South Korean fishing vessel, while in August last yeara submarine collided with an offshore support vessel. USS John S McCain Alnic MC Sources: US Navy, MarineTraffic.